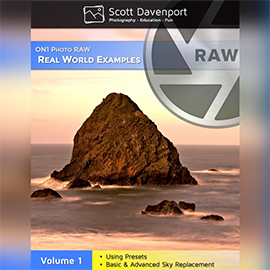 ON1 Real World Examples is a set of crisp, succinct post processing tutorials for ON1 Photo (RAW) 2017. Each video clearly explains a technique and how it fits into your overall processing workflow. The topics covered are not fringe techniques or esoteric stylings. These are core processing techniques that you will use again and again. Using ON1 Presets: A preset is often the first step in a processing session. Choosing a preset is just the beginning. In this tutorial, you will learn how to dissect a preset after it’s been applied, and customize a final look to best match your photo. Basic Sky Replacement: Nature doesn’t always give us a gorgeous sky. In this tutorial, I show you how to replace a dull, boring sky with one that has character. You’ll learn about choosing an appropriate sky for the scene and how to use masking tools in Layers. Advanced Sky Replacement: Some sky replacements are more complex than others. In this tutorial, you will learn more advanced masking techniques. Also, you will learn how to replace skies in scenes with reflections. Note: This download is ~260MB and may take a while to download.